Clash Royale: The Latest Clash of Clans Game! Right now, those are the only countries you can play this game in! But as I said before, several signs point toward the soon worldwide release. So now that you know where you can play it, let get into the real game! So Clash Royale is uses some troops in Clash of Clans and some brand new ones set in the Clash of Clans universe! Some such troops are the familiar archers, lightning spell, tesla, and elixir collector. There are also spinoff troops such as the mini-P.E.K.K.A., baby dragon, and tombstone. 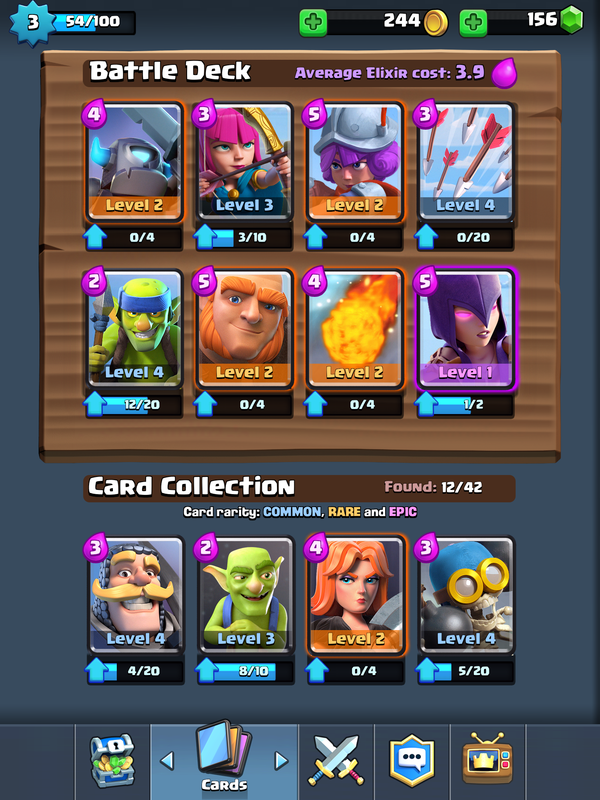 Lastly, there are completely new troops like the spear goblins, rocket, zap, and prince. So out of the many troops you have, (you get new troops from opening chests, which you get from winning battles), you can choose 8 of those troops to take into battle with you. 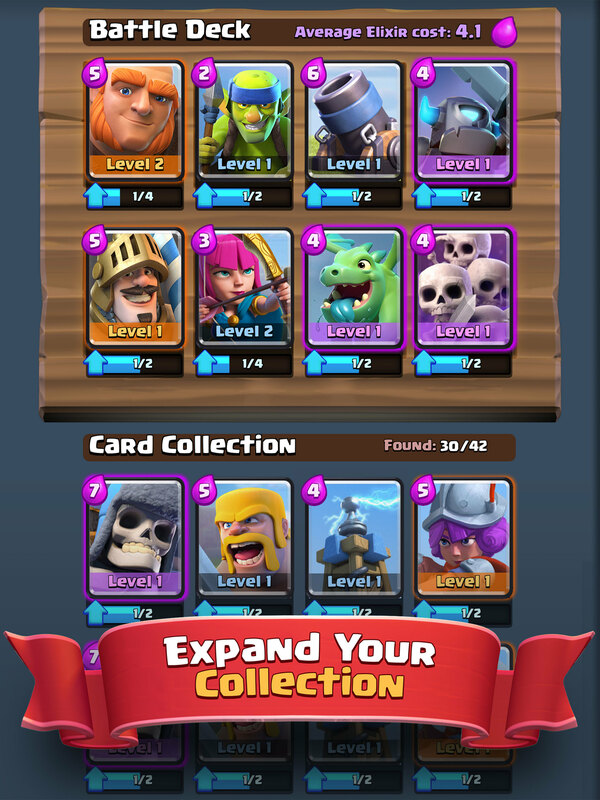 Cards or troops come in 3 levels, common, rare, and epic, in increasing level! Once you get into battle you get 4 cards of your “deck” and you can choose any one of those to play. After you play that card, one of the 4 you didn’t get pops in to take its place. That’s pretty much the basics of the game, how to get started and battling! Lets get into the different screen of the game, to understand what you can do it all of them. The shop is where you can buy cards from the daily store. There will be a different common, rare, and epic card every day. You can also buy chests for gems, buy gems for real money, and buy gold for gems. Gold is used to upgrade cards. This screen is where you can see all the cards you own. The battle deck is the 8 cards that you will take into battle and with your card collection you can upgrade and switch out cards. There is a total of 42 cards currently. This is the main screen in Clash Royale. You can view your XP, gold, and gem amounts at the top. Next comes your name, your clan name and your trophies. Under that is the free chest, which comes every 4 hours, and the crown chest which comes every 24 hours. To open the crown chest, you need to get 10 crowns (crowns are the equivalent of stars in Clash of Clans). For the 4 surrounding boxes, the trophy is leaderboards, the document is battles + inbox, the target is practice battles, and the medal represents achievements. Your arena is the equivalent of leagues in Clash of Clans, with there currently being 7. Lower are your chests, which can be silver (3 hour unlock time), gold (8 hour unlock time), and magical (12 hour unlock time). 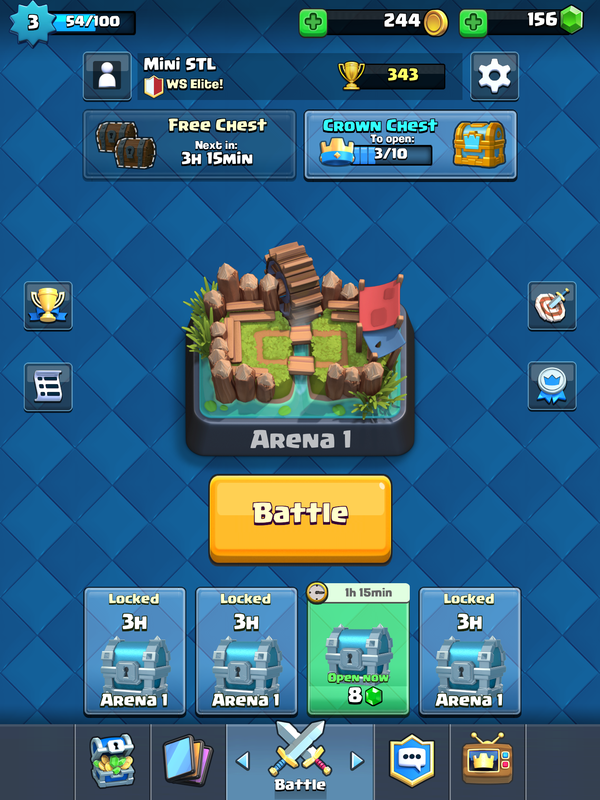 The battle button takes you to a multiplayer battle where you can win chests and trophies. This is your clan chat screen. It is where chats, promotions, requests, and friendly battles. Currently I am leading 2013 WS Rigged, accepting 1200+! If you want to join our feeder it is called WS Elite! TV Royale is where you can go to watch battles from high level players on leaderboards! Its a dream of mine to get on here! Of course with every game there are primary strategies that develop and then change based on your level! Basically, you put your Giant in and Musketeer in behind, so that the Giant takes all the damage and the musketeer does all the damage! This is almost the same concept, but with the Mini-P.E.K.K.A. instead of the Musketeer. The Prince Rush has you only drop the Prince… and rush one of the towers! Just be ready with a fireball or arrows in case the Prince gets distracted. Surprisingly spawning is actually quite a good strategy at the mid level. You can drop your spawner buildings, the gob hut, barb hut, and tombstone, and watch as they overwhelm the enemy base. 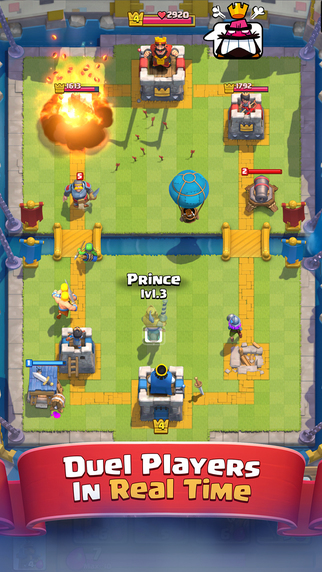 The X-Bow’s range in the game is so great, that it can reach the other towers from your side of the map. You drop the X-Bow and then defend it while it snipes the other tower! The Baby Drag acts as a tank, taking all the fire, so you can get the balloon on top of one of your enemy’s crown towers! The balloon does insane damage every bomb drop! The golem is the highest hitpoint unit in the game and if you get any units behind it, it will protect them! Barbs-Hog is the strategy that I currently use. You drop your barbs with the hog in the middle so that the barbs take the damage and fend off any defensive units, while your hog makes a break for the tower! With the mirror card, you can have 2 of the same troops at the same time. If you mirror the goblin barrel, and send one on one tower, and one of the other it will wreck havoc! 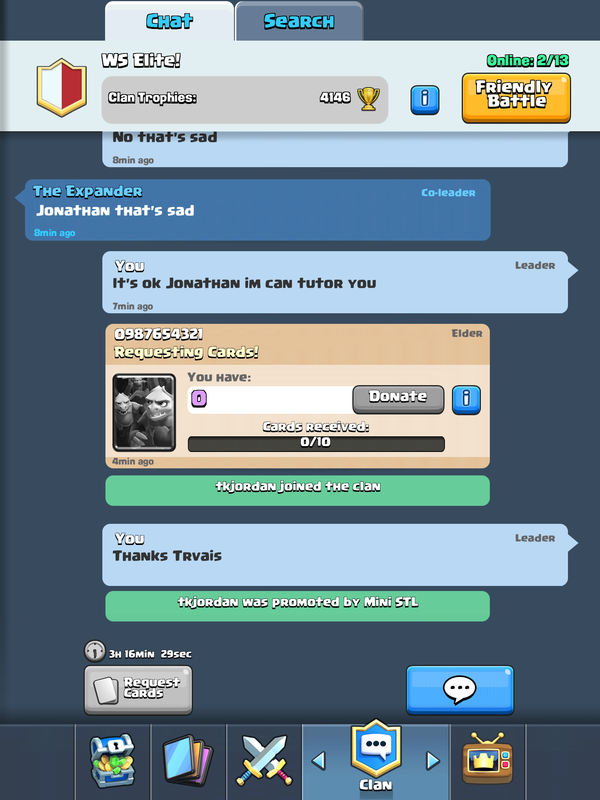 I hope you guys enjoyed this introduction to Clash Royale. Make sure to like this article or leave a comment if you want to see more posts related to Clash Royale! ← New Clash of Clans Updates for 2016! Pingback: Clash Royale: The Latest Clash of Clans Game! | Clash of Clans Guide, Strategies, Tricks and More!